DelightfulDeals is a browser extension that supposedly can help you compare online promotions and deals. This is something that is promised via delightfuldeals.org; however, this website does not offer an installer. Our research team has found that this suspicious browser add-on is usually spread via software bundles along with unpredictable, potentially unreliable software. Needless to say, if malware slithers in, you must delete it as soon as possible. We advise removing DelightfulDeals as well, despite the fact that it is just an advertisement-supported program. Continue reading to learn more about this threat. Although “DelightfulDeals” is the original name, our researchers warn that the suspicious adware might use several different versions of this name. It is unlikely that these versions will be extremely different, but you might have trouble identifying adware. This is the same reason why computer users might have trouble removing AdPunisher, NiceAndFun, HaggleDazzle, and other DelightfulDeals clones. Even though these programs might look different, they were created using the same Justplugit engine, and they all work in the same manner. According to our information, all of these programs are compatible with Mozilla Firefox, Google Chrome, and Internet Explorer browsers, and they can attack several browsers at the same time. Once installed and activated, DelightfulDeals starts injecting ads hosted by remote adware servers. These servers can be employed by anyone, and there is a great risk that they will be exploited by schemers to showcase malicious ads. Malicious ads are the kinds of ads that can use misleading offers to trick users into visiting unreliable websites or to get them involved in scams. Unfortunately, malicious ads can be difficult to identify, which is why we suggest deleting DelightfulDeals even if it is capable of showing useful deals as well. If you have interacted with the ads injected by this adware, you must scan your operating system to see if it was infected with malware that also requires removal. LightningDownloader, Websearch.hotfindings.info, and other unreliable programs have been found traveling with DelightfulDeals. Even more unreliable programs could be infiltrated via the ads injected by this ad-supported program. Use a trustworthy, up-to-date malware scanner to identify which programs you need to delete from your Windows operating system. If you are familiar with the infections installed, you might be able to delete them manually. If you do not know how to detect and remove malware, manual removal is not for you, and we do not recommend experimenting. Manual removal is not the only option. In fact, automated malware removal is far more efficient, reliable, and rewarding. If you install a legitimate, trusted security tool to delete DelightfulDeals along with other unreliable programs, you will not need to worry about any leftovers or other security issues. After all, even if you were successful with manual removal, you would need to implement a reliable security system to keep malware away in the future, so why not do it now to have the removal of DelightfulDeals and other active infections taken care of? Launch RUN (tap keys Win+R) and enter Control Panel. 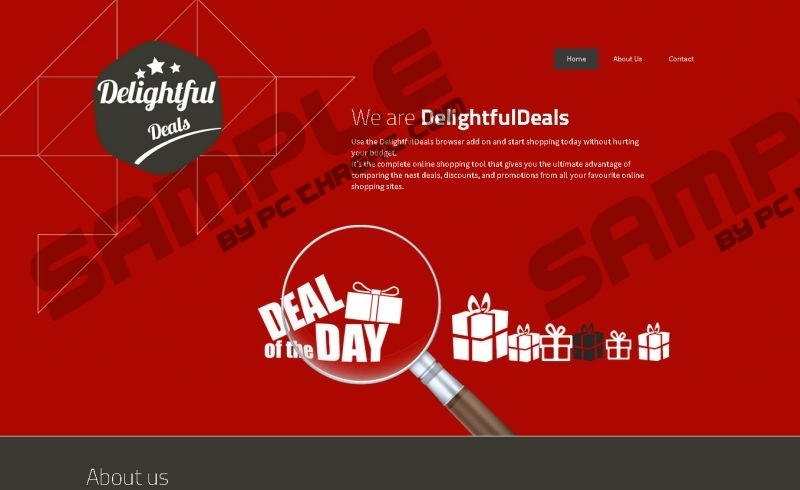 Select DelightfulDeals and click the Remove button. Tap Alt+F, move to More tools, and click Extensions. Click the trash button and choose Remove. Tap Alt+T, select Add-ons, and move to Extensions. Identify the unwanted add-on and click Remove. Quick & tested solution for DelightfulDeals removal.